One of the best things about tile is that you can use it to manipulate perception. If you’re wondering how to make a small shower look bigger with tiling, keep reading because these tips will genuinely help to open your shower up. 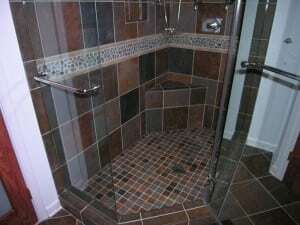 Start by considering the use of glass tiles. These reflect light and give the room a brighter appearance, which is truly remarkable. By combining clear with colored glass to create patterns, you can further enhance the effect. Don’t be afraid to use large tiles on either the floor or the wall or both!! It’s not uncommon for our showroom designers to use 12″x24″ tile on shower walls. The secret partially lies within the use of color. Lighter colors will tend to open the room up. If you’re considering one color for the floor and another for the wall we would suggest using the darker color on the floor. If you want to incorporate a decorative accent we will usually suggest a tile or glass that is darker in color if the goal is to make the bathroom look larger. Finally, consider installing a level entry shower to give your bathroom the appearance of being spacious. Are you curious about how to make a small shower look bigger with tiling? Contact Conestoga Tile and we’ll be glad to give you some tips and suggestions.